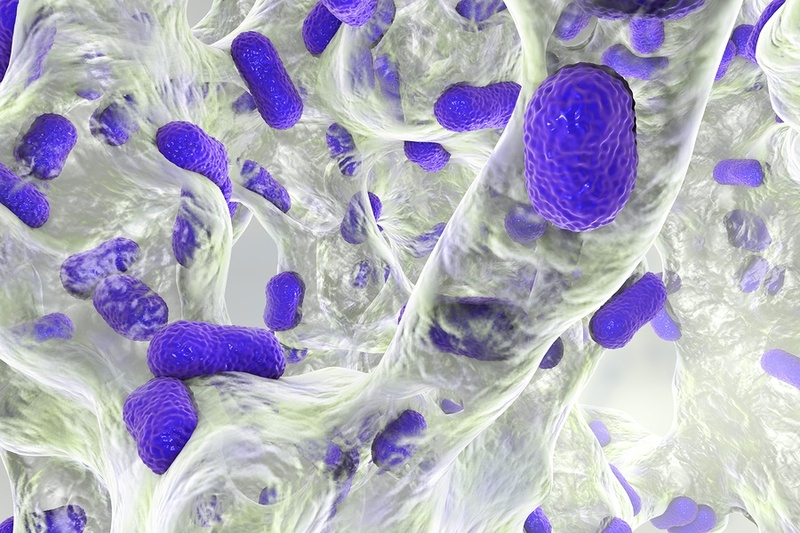 Researchers paving the way to treat antibiotic resistant bacteria. A team of scientists from the institute of Bio-engineering and Nanotechnology of the Agency for Science, Technology and Research and IBM have produced a new "synthetic molecule that can target and kill five multi drug-resistant bacteria. The polymer is non-toxic and could enable an entirely new class of therapeutics to address the growing problem of antibiotic-resistant superbugs." Guanidinium-functionalized polycarbonates were created and found to be biodegradable and non-toxic. The positively charged synthetic polymer enters a living body and binds to the certain bacteria cell by homing in on a microbial membrane's related negative charge. Once attached the polymer then crosses the cell membrane and triggers the solidification of proteins and DNA in the cell which kills bacteria. "We have demonstrated the first example of a biodegradable synthetic macromolecule with broad-spectrum antimicrobial activity in mice, unique killing mechanism and no toxicity," "Once the polymer finishes its job of killing the bacteria, it will be naturally degraded after three days and will not remain in the body. This antimicrobial agent shows great promise for the treatment and prevention of multi drug-resistant systemic infections." says Yi Yan Yang, one of the authors on the study. Researchers tested the new molecules on mice and were successful in removing five commonly known superbugs found in hospitals world wide. Following multiple treatments the bacteria displayed no signs of developing a resistance or signs of toxicity. "In 2016, we demonstrated the efficacy of synthetic polymers to combat deadly viral diseases," explains James Hedrick, from IBM Research. "The current research for treating bacterial infections rounds out our ability to someday treat a spectrum of infectious diseases with a single, new type of mechanism without the onset of resistance." The team is currently on to the next phase of research in works to develop the technology into a specific antimicrobial treatment that can be tested clinically in humans and ultimately become a new way to treat infection. You know what else kills Superbugs? Do you have a chronic infection and are you looking for a safe and effective treatment method? Ozone therapy may be the option for you. Chronic infections such as Hep. C, HIV, HPV, Yeast overgrowth, Epstein-Barr, Lyme/Co-infections and many more can benefit from Ozone therapy. We partner with Empire City Labs. If they accept your insurance - your labs are free and you get a 36 page workup to find the root cause under your condition. We test for toxic mold exposure, Lyme and co-infections, unexplained chronic fatigue, full adrenal and thyroid panels, advanced cardiac panels, food allergies, irritable bowel/leaky gut panels, hormones, heavy metals, viral syndromes, genomics and pharmacogenomic testing for medications to see if you should or should not take certain drugs. We have advanced ozone therapies to treat your condition. All chronic disease is caused by altered intestinal microbiome or leaky gut and chronic disease utilizes oxygen so you become oxygen depleted. Ozone increases your oxygen utilization so your body can heal rapidly. We are trained and board-certified in the leading international ozone therapies. I.V. ozone alone or paired with chelation, glutathione, Meyer's cocktails are part of our treatment options. We have the most advanced ozone equipment from Germany in the world for 10 pass MAH. We offer bladder, vaginal and rectal ozone insufflation. Isadora Guggenheim is a board certified and licensed naturopathic physician and RN in CT.
Over the past thirteen years, and over 6000 clients, I've successfully treated neurological disorders, Parkinson's, Lyme disease, MS, inflammatory arthritis, Hashimoto's, thyroid conditions, erectile dysfunction, cardiovascular disease, allergies, ADD/ADHD, infertility, asthma, mood disorders and hormone imbalances. Treating autoimmune conditions is personal to me because I have experience with an inflammatory autoimmune disease. Because I've felt the pain and fear of a chronic, debilitating illness, I am on a mission to prevent and reverse the ravages of autoimmune disease. Isadora Guggenheim has advanced training in environmental medicine, oncology, I.V. therapies and Ozone. Naturopathy is defined as the diagnosis, prevention and treatment of disease and health optimization by stimulation and support of the body’s natural healing processes, as approved by the State Board of Naturopathic [sic] Examiners, with the consent of the Commissioner of Public Health. Also included in the expanded scope of practice are ordering diagnostic tests and other diagnostic procedures, ordering medical devices, including continuous glucose monitors, glucose meters, glucose test strips, barrier contraceptives and durable medical equipment; and removing ear wax, removing foreign bodies from the ear, nose and skin, shaving corns and calluses, spirometry, tuberculosis testing, vaccine administration, venipuncture for blood testing and minor wound repair, including suturing. Isadora Guggenheim is a licensed nurse practitioner and massage therapist. Isadora Guggenheim offers holistic health consults, nursing services, patient education, nutritional counseling and massage therapy. She works with Dr. Janis L. Enzenbacher, M.D. and administers ozone therapies. Isadora Guggenheim is the head nurse practitioner of all I.V. therapies. The practice of the profession of nursing as a registered professional nurse is defined as diagnosing and treating human responses to actual or potential health problems through such services as case finding, health teaching, health counseling, and provision of care supportive to or restorative of life and well-being, and executing medical regimens prescribed by a licensed physician, dentist or other licensed health care provider legally authorized under this title and in accordance with the commissioner's regulations. As a nurse practitioner, Dr. Guggenheim is recognized as a primary care provider who can diagnose and treat patients. She has full prescribing rights and works collaboratively with Dr. Janis L. Enzenbacher, M.D. The practice of the profession of massage therapy is defined as engaging in applying a scientific system of activity to the muscular structure of the human body by means of stroking, kneading, tapping and vibrating with the hands or vibrators for the purpose of improving muscle tone and circulation.